MetalCloak's TJ/JK Cam Bolt Filler Plates are designed to work with Both Jeep Wrangler JK's and TJ/LJs covering the cam-bolt knock outs on the front control arms if they have been removed or damaged. 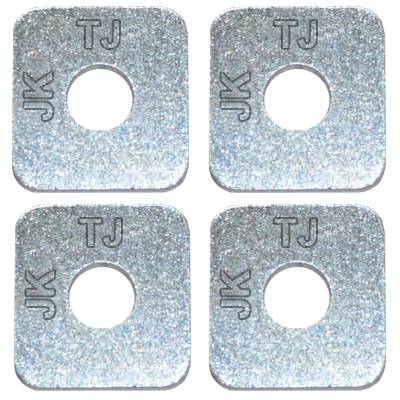 These heavy duty plates are designed to fix a common issue on TJ/LJ & JK Wranglers that have had cam bolts used to adjust camber. The eccentric design allows for easy installation no matter what Jeep you have. Engineered to fit perfectly into the factory "slotted" location. Eccentric design allows them to be used in either TJ/LJ or JK Wranglers that have had the cam bolt knock outs removed. Thick steel for the strength needed and finished with a durable zinc protective coating. 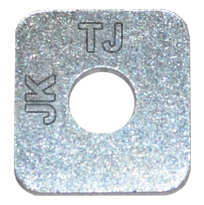 Cam bolt filler plate is used to cover the hole if the knock outs have been used on factory JK or TJ/LJ front control arm brackets. 1. 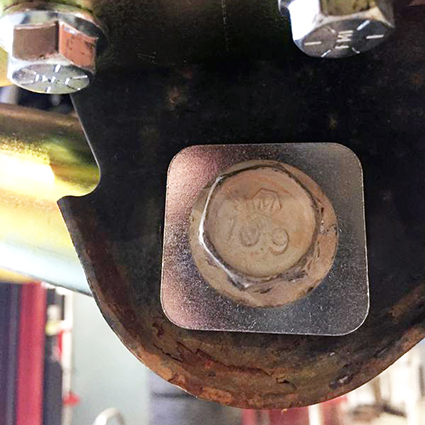 After removing the lower control arm bolt, turn the cambolt plate so the designation of JK or TJ is in the upward position for the model Jeep it is being installed on. 2. The cambolt plates are eccentric so there is only 1 correct way to fit them into the existing slotted location on the control arm brackets. 3. Install 1 cambolt plate to the outside of each control arm bracket: 2 per bracket. 4. Reinstall control arm bolt and torque to spec.